Entrepreneurship starts with an idea and a dream: a dream of a better world for others, and a life less ordinary for yourself. These days, more people than ever are full of world-changing ideas and, thanks to technology, have the means to bring them to life. But many ideas remain just ideas, and many dreams just dreams. 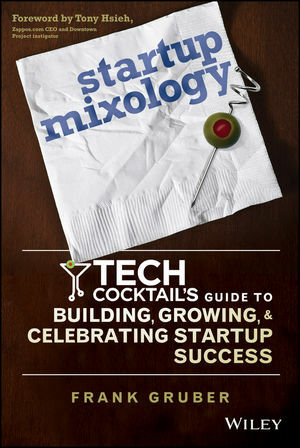 Startup Mixology is first and foremost a book about turning your ideas into action. From the cofounder of media company Tech Cocktail, a veteran entrepreneur and investor who was named one of the most connected people in tech, this book covers the basic "ingredients" of winning entrepreneurship. No abstract theories here — it shows you how to tackle everything from idea generation to launch to marketing to funding and how to start getting things done. Once you've taken that first step, the journey has only begun. Startup Mixology tells it like it is — and it's not easy! You'll learn about the harsh reality of starting up: what happens when you offend your customers, get no attention, or run out of money. These are the stories you don't always hear in the media. In the end, Startup Mixology is an optimistic book. You can do this — and you can have fun doing it, too. Every chapter also shows you how to enjoy the journey along the way - because if you don't, what's the point of it all? From cake baking to workations to llama parades, you'll learn how entrepreneurs around the world stay sane, reduce stress, and celebrate the positive. This may seem fluffy, but it's actually one of the biggest secrets of successful startups. Inside, you'll find the stories of companies like MakerBot, WordPress, Zappos, Basecamp, Uber, and more. Hear in their own words how they survived the startup phase, and learn from the straightforward and conversational Frank Gruber, who has met thousands of entrepreneurs and watched them grow their businesses. In many ways, entrepreneurship will be the most difficult undertaking of your career. But if you can find the right balance of hard work, support, and celebration, it can also be the most rewarding. Startup Mixology takes you through the whole process from start to finish, so you can begin the incomparable journey of turning your great ideas into great startups. FRANK GRUBER grew up in the Midwest heartland and is an entrepreneur, new media journalist, and investor. His alma maters include Purdue and Northwestern respectively. He cofounded Tech Cocktail in 2006, which has grown into a hub for the creative class, offering tech startup focused news, events, and resources. Frank has built and launched products for the masses while at AOL, Tribune, and Classified Ventures along with startup efforts like Thankfulfor, Splog Reporter, and more. As a journalist his works have been featured in a number of top media publications. He was named by Forbes as one of the most connected people in tech. Frank is also a Venture Partner with Crystal Tech Fund.